I really love being at spiritual retreat centers. Over the last few years, they have been a respite from day-to-day preoccupations and high-speed pace. More importantly, they have provided a chance to more honestly look at myself and to consider the big questions of life. I always seem to leave with new perspective and refreshed intention. Plus, they seem to somehow always be in the most beautiful places, offer the most delicious and wholesome food, and provide opportunities to talk (or at least be in silent presence with) really interesting people. So back last year when Miral and I realized that we needed to find something to do for a few months after our time in South America so that we didn't arrive in Africa smack in the middle of monsoon season, the idea of volunteering at a retreat center quickly came to mind. We both agreed that it would need to be at a center where both a Christian and a Jewish-Buddhist would feel comfortable and be nourished. Through a bit of a maze of coincidences and recommendations, we found our way to the website for Schweibenalp (pronounced “Shv-eye-bin-alp”) Center for Unity. The Center was described as a spiritual home honoring all of the major religious traditions. After reading the details, we knew we had found the kind of place we wanted to be. We have been working as volunteers here now for almost two months. True to form, the location of the Center in the Swiss Alps (just outside of Brienz; not far from Interlaken) is one of beauty that can't be described in words. The best you can do is try to find words for the energy you feel at the place; to me, the feeling in these mountains is “dignified” and Miral experiences it as “sweet.” Better than words, though, are images – so check out the photos in our Schweibenalp gallery and you will see what I mean. (You hopefully know this already, but photos from our entire trip are presented in galleries in the right-hand margin of the main page of our website.) You will see why you can't be here without having your heart stirred. For me, a connection with this land and this Center is deepened with an appreciation of its history. According to the Schweibenalp website, archeologists have found evidence that Druids were among the earlier human inhabitants of the land. They experienced power in the stones, trees, and caves of the area. The peoples of the area were converted to Christianity in the 6th and 7th centuries, and worship of the land was replaced by a large local monastery. Also, the famous Christian pilgrimage route, the Way of St. James, passes right through the land on which Schweibenalp sits. The land became a health resort for people suffering from tuberculosis at the turn of the 19th century and then was turned into an orphanage after World War II. By the late 1970s, though, the land was all but abandoned. 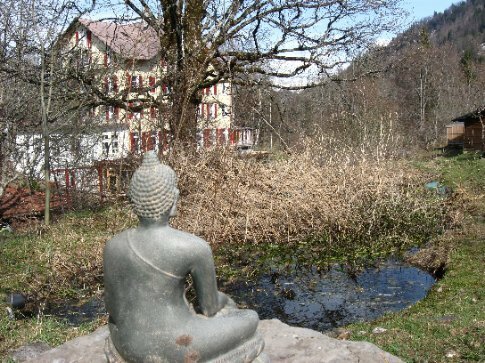 In 1981, Sundar Robert Dreyfus (who everyone here simply calls “Sundar”) was commissioned by his Hindu guru, Sri Haidakhan Babaji, to develop an ashram (traditionally, a spiritual community bound by the teachings of a Hindu master) in Switzerland. After the land was acquired for that purpose in 1982, a small community of people came to “live in truth, simplicity, love, unity, and peace.” They engaged in temple service, voluntary work, and meditation. They built a place to perform traditional fire puja ceremonies (a purification ritual practiced within certain esoteric types of Hinduism and Buddhism) and did so on a daily basis for over twenty years. From the beginning, services and rituals of various Western and Eastern religions were also performed at the Center, and it attracted seekers and believers of many traditions. The mission of the Center of Unity was to provide a home for a “religion of the heart” formed by the connection between traditional religions and other forms of spirituality. The Center is currently undergoing major physical changes. There has been renovation occurring within the main guest house (where we have been living) through the entirety of our visit, including the addition of a new dining room, a new reception area, a new bookstore, updating of bathrooms and windows, and replacing the roof. Other changes, like adding a flow of glacial water through the property and eventually building the largest seminar space in Switzerland are planned. The main guest house used to offer separate meditation/prayer rooms for each of the major religious traditions – so that all visitors could practice as they were comfortable – but these have now been moved and combined into a single, less-central temple. A groundskeeper workshop is being reformulated into a central prayer/meditation space that will be specific to no single religious tradition with the intention that it will feel welcoming to all. I have felt all of these changes in vision and in physical manifestation strongly in the form of a somewhat chaotic and sometimes contradictory energy. In addition to the usual commotion and goal-orientation of a construction site, it seems that there is an ongoing process of clarifying the vision, finding the right practical ways of working toward it, and finding the right balance between being being open to new possibilities without losing all semblance of a form. For example, there is no single communal vocabulary in this fledgling enlightened society, like the ones people often rigidly adhere to when they are in a community based on a single religion or set of teachings. This I love. But it creates challenges in communication and perceived intentions. Still, these challenges seem to me to be much more like life in the diverse real world than when communities are bound tightly by a single shared way. This new Center is very much a work in early progress – with all of the groundlessness and, also, creative energy, that goes along with that. I think it is an incredibly interesting and inspiring experiment, and I really hope to find a way to track its development after we move on. Within all of this transition and groundlessness, the Center has provided me with great opportunity for spiritual contemplation, personal exploration, and the development of a strong connection to the land and its community. Our lives as volunteers here are pretty straighforward and provide a lot of space. Along with anywhere from two to four other volunteers, we each work five days each week for seven hours each day in tasks like housekeeping, kitchen help, and tending the grounds. The work is not too easy as to be overly boring and not too hard as to be overly taxing; it is the kind of work that is perfect for trying to maintain mindfulness during the day. And the work is pretty easily left behind at the end of the day, which makes for a pretty stress-less existence. It has also been a great experience in doing this work, to return to the role of a novice and the freshness of a Beginner's Mind that goes along with that. True to its renewed mission, the level of ritual or formal spiritual practice at the Center is limited. Each morning there is a gathering of the community for a brief contemplative activity they call “bonding.” It could be a meditation practice, a movement practice, a song, a poem, a playful game; just some way to begin the day with a reminder that we are living in community and to focus our intentions for the day. The only other rituals are a weekly evening gathering to sing together and, one or two times each week, a traditional Hindu fire puja is still performed by Sundar for anyone wishing to attend. Different religious holidays, special events, and impromptu gatherings also happen (I plan to share some of these in my next post!!). We also have a weekly Volunteers Meeting, which provides time to discuss deeper aspects of our experience in the community. (The full-time staff also participate in many weekly meetings like this, but we are not a part of those meetings. )We have sometimes been invited to participate in some of the rituals held by groups holding workshops at the Center. And the spaciousness of daily life here has allowed me time to maintain my personal ritual of formal meditation practice each morning. There is no emphasis on silence at this Center. But the fact that I do not speak German (well, except for the handful of Yiddish words I grew up with that are great to hear being used in a living language! Who knew people really say “shmutz,” and “schlep” and “shvitz?”) has left me on the periphery of many of the day-to-day conversations. With a mind that is not as stirred up as usual by typical social issues and pressures, I have had a two-month experience that is a bit like attending retreats that enforce silence. In other words, it has given me the chance to better notice and more deeply experience what is happening each day. There is simply nothing like pausing from cutting firewood and looking out to the mountains surrounding this Center on a sunny day when my mind is slow enough to be no place but there. When I am in situations like this, I also see more clearly the unique struggles of everyone around me and, even more so, myself. So much impatience, anger, sadness, self-protection. But then I also see so much undeniable beauty being constantly expressed by people – mostly in simple little acts, like making a homemade recipe of herbal tea for someone with a cough. It's such a strange paradox to be confronted with so much that needs to be improved while also feeling how precious and stunning this life already is. The language barrier has certainly sometimes caused communication challenges and the discomfort of feeling excluded. Still, most of the people here do speak at least some English and some are completely fluent. They have, to a person, been so generous and gracious in offering translations at meetings and extending themselves to talk in English with us. So, I have felt like a full participant in the communal work that is happening here and I feel really thankful for that. We have especially gotten close with our co-volunteers. And beyond any words, there has been communication and a connection forged at a heart level. Anyone who has sat a silent retreat knows the bond that can happen with people you've never even spoken to. So it is not surprising to me that despite the language challenges, I feel really connected to some of the incredibly sweet and beautiful people we have lived with these last two months. In the hollow of His/Her hands. Whether sung to people who have been at the Center for only a few days or for a few weeks, each time it feels like an acknowledgment that for the time that person was at Schweibenalp, they were a valued member of the community and that their unique presence will be truly missed. The words have felt like a perfect expression of what was in my heart as some people have left. And in just a few days, Miral and I will be the ones standing in front of this community, looking into the eyes of each of these people who we have lived with these two months, feeling the intensity of all of the daily struggles and all of the moments of beauty, and then we will carry with us this experience as we leave for Uganda, and the new struggles and new beauty we will find there.